I love fried calamari but often they can be served up quite bland. However, a few restaurants in Argentina showed me that the overall experience can be kicked up a notch with the addition of fresh parsley and garlic (rabas a la provenzal). Here is a recipe I came up with to recreate those wonderful dishes I’ve enjoyed. Combine flour, corn starch, baking powder, and salt in medium or large bowl. Add beer, garlic, and parsley, and whisk well. Lay out rings on a flat surface or cookie sheet and dust all sides with extra flour. Working in batches of 5-6 rings, dip and coat each ring in batter–separately–and gently drop into deep fryer. Immediately after, use a metal fork or cooking tongs to separate pieces in order to prevent them from sticking together. Cook for 4 minutes. Drain and set aside*. Serve with lemon wedges. 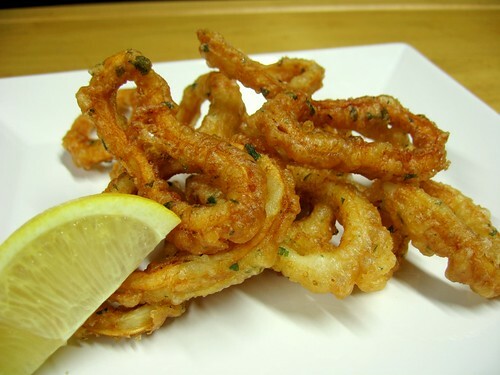 *Tip: I will usually lay a strip of parchment paper on a cookie sheet in a warm oven (lowest setting with door set ajar) to keep the cooked calamari warm and crisp while frying the remaining batches.